The Oregon CS250E PowerNow 40V MAX Cordless Chainsaw is a powerful, lightweight chainsaw that delivers a combination of performance and features that make it a true alternative to most gas-powered chainsaws. Powered by a 40V MAX Endurance Lithium-Ion battery, the CS250E offers a longer battery life and increased runtime than the 40V MAX Standard Lithium-Ion battery while providing the same powerful cutting performance without the hassle of gasoline or cords. Lithium-Ion power also means instant start capability, so there's no need to deal with inconvenient pull cords. The 14-in guide bar allows the CS250E to power though logs up to 12-in in diameter, and handles up to 250 smaller cuts on a single charge. A built in PowerSharp chain sharpening system keeps the chain working like new, extending chain life and increasing productivity. 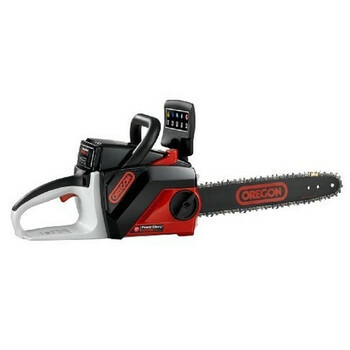 The Oregon CS250E PowerNow Cordless Chainsaw kit features the B500E 40V MAX 2.4 Ah Endurance Battery Pack, a Lithium-Ion battery combining high capacity cell technology for increased power with a simple, lightweight design. The B500E delivers an increased battery life and tool runtime compared to the B500S 40V MAX* Standard Battery pack while still providing consistent no-fade power for maximum performance up until complete discharge, and will last approximately 1,000 charging cycles.